If you’re on any sort of restricted diet, going to a dinner party at someone’s home can be tricky—sometimes it can feel like an imposition on your host to explain what you will or won’t eat. Or there’s that awkward moment when you and your host both realize that she inadvertently has not made anything suitable for you to eat. Oh, let’s not forget that “special” friend who invites you over but truly doesn’t care whether there’s food for you to eat and refuses to alter her menu at all. This dilemma is not exclusively reserved for vegans and vegetarians—if you are limiting your salt or sugar or fat or nuts or allergens or cupcakes (oops, did I say that out loud? ), then you know what I mean! Recently, dear friends invited us to their home for an intimate, gourmet dinner and I just knew that the food, wine and ambiance would be truly special. 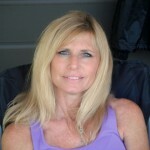 Michele, our hostess, is quite the accomplished chef, having been trained in the culinary arts and a passionate lover of great food and its preparation. Her creative talents abound—her “day job” as a successful clothing designer for her own company is apparently just one of her many gifts. So when she assured me with utmost confidence--“Don’t worry, Ellen, I’m making something fabulous for you, too!”— I was excited and flattered by her attention to my veggies-only lifestyle. 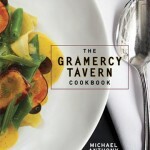 As thrilled as I was to eat and enjoy Michele’s lovingly prepared meal, I was also secretly chomping at the bit to get my hands on the recipes and recreate them at home. I’m happy to report that my rendition of these two dishes were met with ooh’s and aah’s from my family and deemed a big success! Sharing them with you is such a pleasure because this is an easy and elegant plant-based meal that is bound to please everyone. The first course was sheer delight for the eyes and the tastebuds. 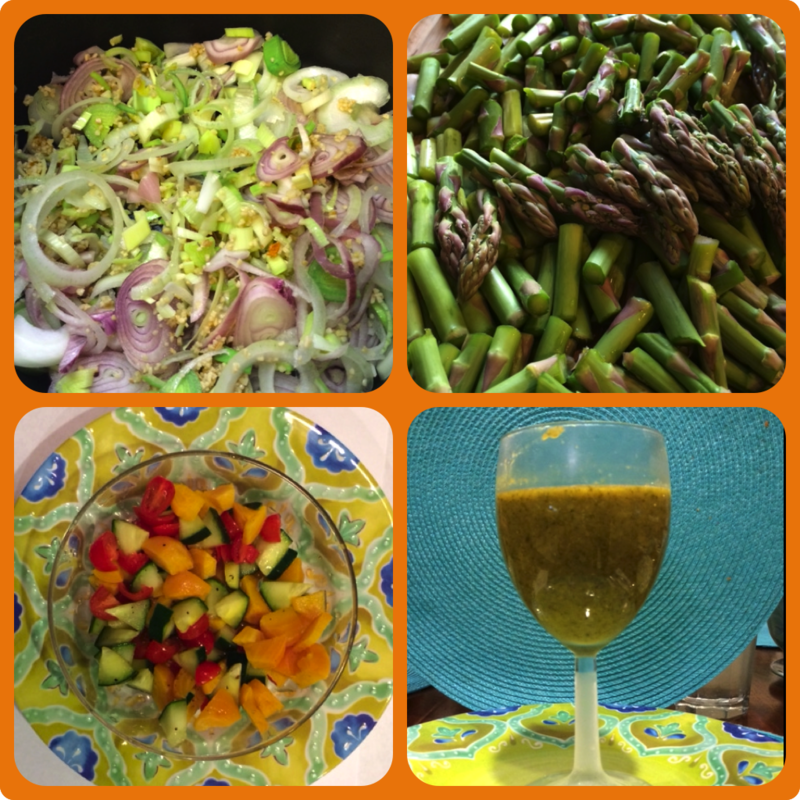 What could be heartier and healthier than a “spring-is-blooming” chilled asparagus soup? Luscious green and quite cold, the asparagus soup was elegantly served in clear glass, stemmed or footed bowls bought in Paris and was a very pretty presentation. 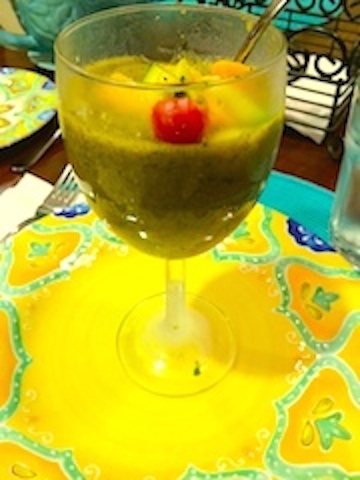 When I made this at home, I used the largest wine glasses that I had—goblets, I think—and topped the soup with a tangy garnish of chopped grape tomatoes, yellow baby beets and cucumbers. This tri-color burst of flavor nicely complemented the smooth flavors of the soup. While making the soup and tasting it along the way, I decided that it could definitely be served deliciously hot, as well. The mixture of onions, shallots, garlic and leeks forms a wonderful base for a substantial soup, hot or cold! Since there was a bowl of leftover soup in the fridge afterwards, I discovered you could literally drink it in a glass like smoothie! So versatile! If serving chilled, it needs to be made ahead so that it has time to get to a cold, refreshing temperature. After being dazzled by the first course, my expectations shot upward for the second course. I was again thrilled with our devoted chef’s choice of main course for this self-proclaimed and appreciative Vegan American Princess! 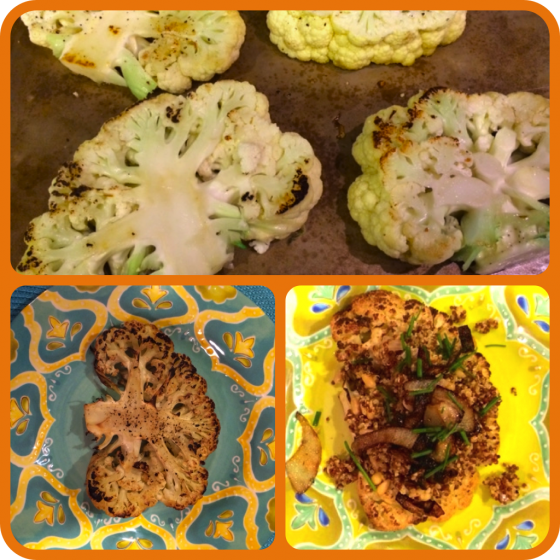 Cauliflower Steaks Topped with Quinoa was so delicious looking that I thought I caught some jealous gazes from the other diners coming my way. The great thing about this dish is the clever way the cauliflower is sliced in order to create a cross-section of the veggie in the form of a thick slab. You bring out the flavor by quickly pan-browning the slices on each side, followed by roasting them in the oven—easy for cooks of every level! 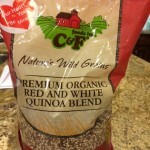 The quinoa recipe has the wonderful flavors of onions, shallots and garlic underlying it. Michele used chopped dried persimmons (so exotic) mixed into it, which gave it a mild, elegant sweetness. When I made this at home, I switched it up to a more savory version to please my family’s tastebuds, opting for chopped sun-dried tomatoes and pine nuts instead and, always, a winner in my house. I was looking for a real pop to sit atop my creation and decided to learn how to make caramelized onions, something I always love eating but didn’t know how to make. 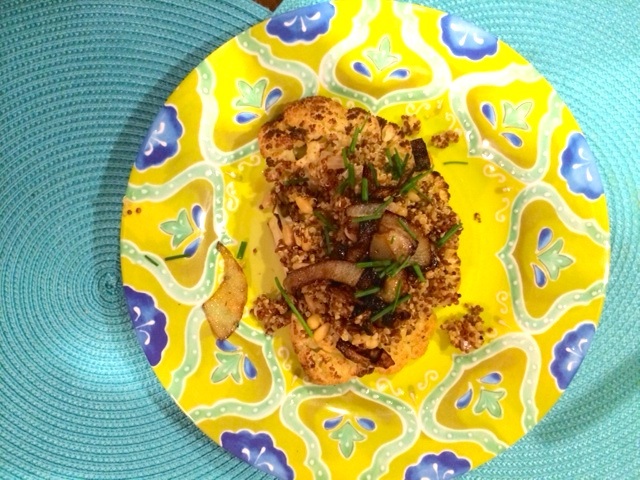 This dish got wow’s at both the dinner party and at my house! Bottom line—easy, elegant, impressive, delicious, plant-based (not that anyone will notice the last one!) These two recipes are so great because they have so many optional, moving parts! Instead of asparagus in the soup, opt for zucchini or broccoli! 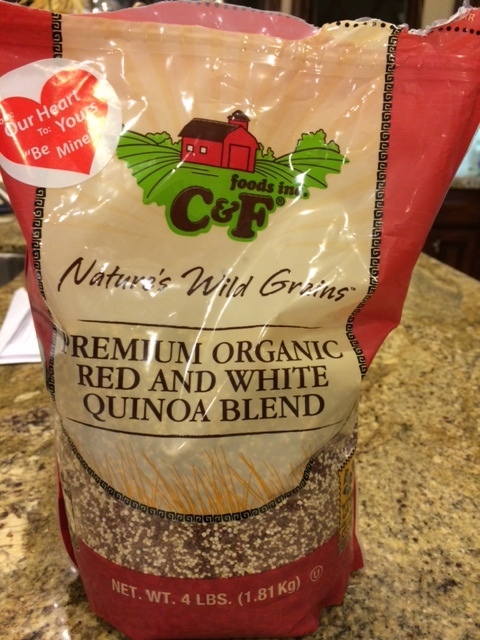 Instead of topping the cauliflower steaks with quinoa, try using a different grain like farro or coucous, go gluten-free with kasha or rice, or go all veggie with a melange of different mushrooms chopped and sautéed with onions and shallots. I can even envision a cold chopped beet and arugula salad atop the cauliflower. The possibilities are endless! In a large pot, heat the olive oil over medium heat. Add the onions, shallots, leek and garlic and cook, stirring occasionally until the onion is softened, about 6 minutes. Add the thyme and lemon juice and cook, stirring for 1 minute. Add the vegetable broth and bring to a simmer. Raise the heat to high and add asparagus, season with salt and bring to a boil, cooking for about 3-5 minutes until the asparagus is tender. Add the spinach, parsley and basil. As soon as the greens are wilted (about 1 minute) pour the mixture into a large bowl and place in freezer to cool. Occasionally stir to help cool it quicker. Season with salt, cover and refrigerate. Boil the baby beets in salted water (about 10 – 15 Minutes). Remove from heat and run under cold water, removing the peel. Dice into small chunks. Place beets in a small bowl with the tomatoes and cucumbers. Season with lemon juice, olive oil, salt, pepper. Ladle the cold soup into bowls or large goblets. Top with the garnish. Increase the heat to high, add 1 cup of vegetable broth and the thyme and season with salt and pepper. Bring to a simmer. Cook covered until almost all the liquid has been absorbed, about 15 minutes. Remove from heat and let stand for 5 minutes. Discard the thyme sprig. Trim the stem of the cauliflower so that the dead sits flat on the cutting board. Cut down through the center of the head, making 4 thick slices. If most of the slices have the stem attached and leave it that way. 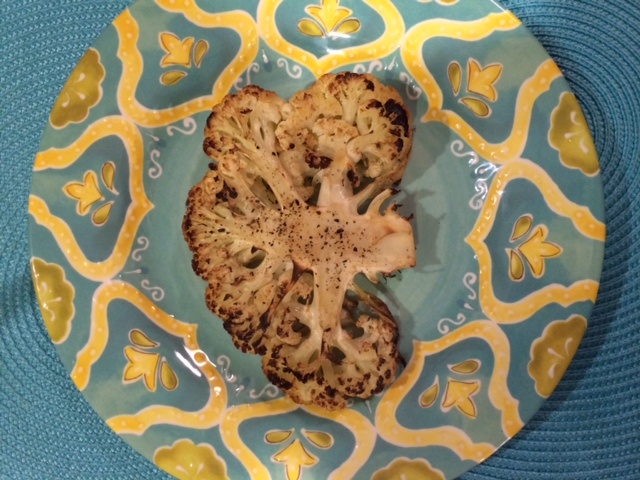 I was able to get 2 good slices from 1 head of cauliflower and the rest fell into florets that I saved for another time. So I used 2 head of cauliflower to get my 4 thick slices. Heat 2 tablespoons of olive oil over medium high heat in the a large skillet. Brown the cauliflower slices on both sides, about 3 minutes per side. Transfer to a baking pan. Season the cauliflower with salt and pepper and place in oven. Roast until tender about 15 minutes. Meanwhile add the chopped sun-dried tomatoes and pine nuts to the quinoa and gently heat through, stirring. Lay the cauliflower slices on plates and spoon the quinoa on top. Top with caramelized onions and the chopped chives. Slice the onion into half rings. Thin rings will cook faster, thick rings will be more robust and rustic. In a large skillet, add the olive oil and heat to medium high. Add the onions to the hot oil and stir until they are coated. Add a pinch salt, a pinch of pepper and pinch of sugar. If the onions are becoming dry and are sticking to the bottom of the pan too much, add a small amount of water, vegetable broth, wine or balsamic vinegar and stir vigorously to deglaze. 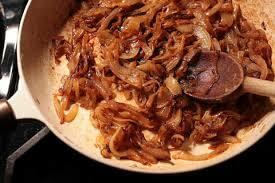 Continue to cook and deglaze until the onions have reached the color and texture you desire. This could take 30-45 minutes to reach the rich brown flavorful color. 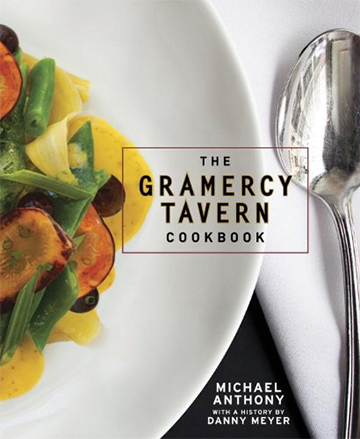 The soup and cauliflower recipes were originally inspired by The Gramercy Tavern Cookbook with various changes made along the way. How do I print up these recipes? I like to have a hard copy in front of me while I am cooking. It took me 25 min and some obfuscated way but I managed to figure out how to pin them. We’re not geared to print only the recipes yet but we’re working on that. Copying and pasting might work. Thanks for hanging in there and being a fan!